BRUSSELS, Belgium, 2017-Dec-19 — /Travel PR News/ — As part of ambitious global growth plans, Carlson Rezidor Hotel Group – one of the world’s largest and most dynamic hotel groups – has announced two new additions to its Europe, Middle East and Africa (EMEA) Regional Business Development team, to signal its commitment to accelerate growth in key European markets. Mauro Vinci joins the company as Senior Director Business Development, Italy, with the responsibility of leading Carlson Rezidor’s development and transaction activities in his native country. Also bringing considerable localized expertise to the company’s hotel under management model is Adela Cristea, who has taken up her post as Senior Director and Head of Development, UK and Ireland. Mauro Vinci began his career in managerial roles at Accenture, gaining experience in the financial and performance management department. After gaining a Master’s degree in Real Estate at the prestigious Italian financial school – SDA Bocconi Milano. 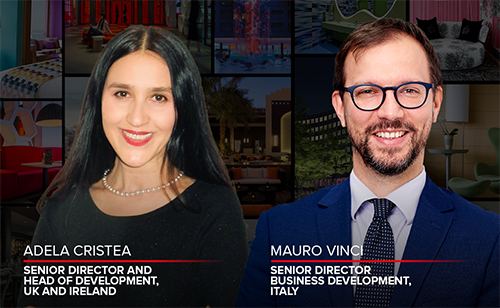 In 2010, he joined the NH Hotel Group where he was promoted four times in six years and quickly progressed to the position of Development and Asset Director of the company’s Italian business unit. Mauro has managed the growth of NH in Italy in the last five years, adding ten new hotels to the company’s portfolio in key destinations, including Rome, Milan, Venice, and Taormina. Prior to joining Carlson Rezidor Hotel Group, Adela Cristea was the Director of Development at Hilton Hotels, with responsibility for executing the growth strategy and expansion of the company’s brands in Central and Eastern Europe. Originally from Romania, Adela has extensive experience in both consulting and hotel operations. She spent six years working as managing consultant at Humberts Leisure and consultant at TRI Hospitality in London, where she contributed to the foundation of the hotel benchmarking database, Hotstats. She has also participated in producing various publications on the hotel industry across the UK, while achieving an MBA from Hult International Business School, London. She has also studied Corporate Finance at London Business School. Mauro will be based in Milan, and Adela in London. They will report to Elie Younes, Executive Vice President, Chief Development Officer of the Carlson Rezidor Hotel Group EMEA. Carlson Rezidor Hotel Group is one of the world’s largest and most dynamic hotel companies and includes 1,440 locations in operation and under development with more than 230,000 rooms and a footprint spanning 115 countries and territories. The Carlson Rezidor portfolio includes a powerful set of global brands: Quorvus Collection, Radisson Blu®, Radisson®, Radisson RED, Park Plaza®, Park Inn® by Radisson and Country Inns & Suites By CarlsonSM. Guests can benefit from Club CarlsonSM, a program that redefines hotel rewards with a collection of exceptional benefits, services, and privileges at more than 1,000 hotels worldwide. Over 95,000 people are employed in Carlson Rezidor Hotel Group hotel systems and the company is headquartered in Minneapolis, Singapore, and Brussels. For more information, visit www.carlsonrezidor.com/ and follow on Twitter @carlsonrezidor. This entry was posted in Business, Hospitality, Hotels, Travel, Travel Management and tagged Adela Cristea, Carlson Rezidor Hotel Group, EMEA Regional Business Development team, Mauro Vinci. Bookmark the permalink.